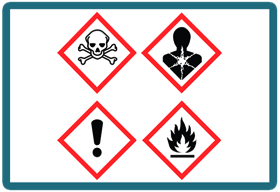 WHMIS Train-the-Trainer and GHS Primer: In-house training can be arranged for groups. Public registration courses are offered throughout Canada. Check our course schedule for upcoming dates. These courses are presented on-site at your location, and focus on the WHMIS-controlled products in your workplace. Please contact us for details on our customized New WHMIS (WHMIS 2015) workplace training solutions. Our half-day TDG classroom course is delivered on-site at your location. General orientation on all classes of dangerous goods is included. We can also address specific shipping descriptions and safety marks for commodities, or classes of dangerous goods, handled by your company (excluding Class 1 and Class 7). CHEM Safety also offers propane-specific TDG training classes for employees who handle, transport, or offer propane/ LPG for transport. TIP: WHMIS Inspectors will look for evidence that workers can work safely with the specified chemical products they handle. Information about how WHMIS communication systems work – we call this the education component. It addresses the content and significance of supplier labels, workplace labels, other identifiers, material safety data sheets (MSDS) and how WHMIS works in general. Site-specific or job-specific instruction that shows employees how to work safely with particular WHMIS controlled products – we call this the training component.